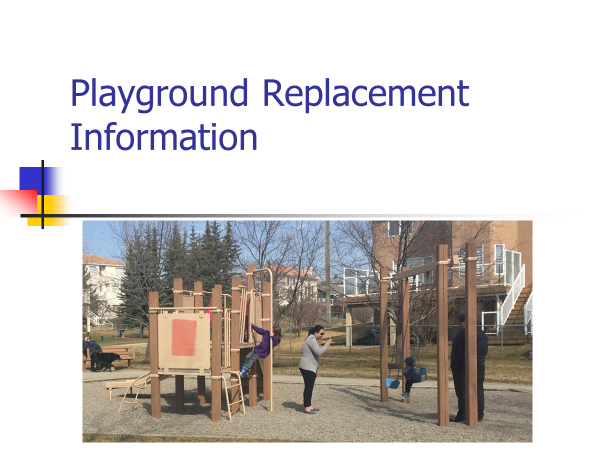 We are very excited to announce that all the funding is in place for the new playground. There have been many people involved with this legacy project. It has been a great way for neighbours to come together for a common goal. Thank you to everyone for your support. A grand opening event is being planned for September, which will involve the entire community of Hawkwood. We are counting down the weeks until we build the new playground. Construction will proceed in the rain or sunshine. We need a few more people to help with construction and site safety. If you haven’t signed up yet – please consider spending a few hours to help build this legacy project for our community. Any one over 18 years can volunteer for a ½ day, full day or both days. Breakfast, lunch and snacks will be provided for all volunteers. The city of Calgary has donated a picnic table to our playground. It will be placed under the trees on the grass on the west side of the playground. We have used the donation from the Hawkwood Community Association to add some play panels. Do you have a budding musician in your family? There are a couple of features they will really enjoy!